Kevin’s paintings and prints have been shown across the country, including exhibitions of his work in California, New York, Massachusetts, Montana, Minnesota, Arizona, and the District of Columbia. In 2016, he was elected a member of the Salmagundi Club, one of the oldest arts organizations in America, and his paintings are shown in the Club’s Fifth Avenue galleries in New York City. 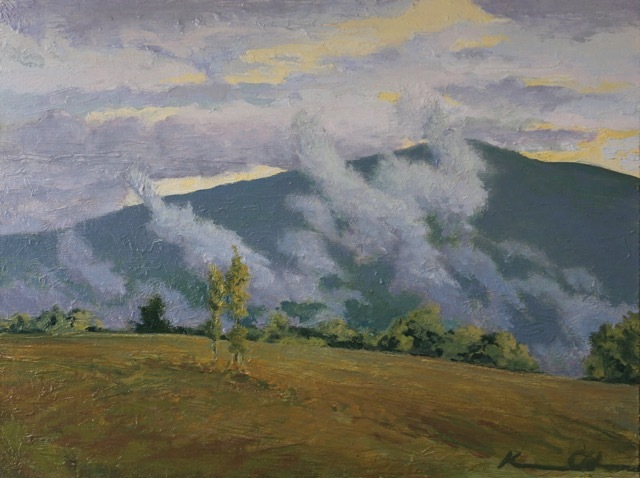 The U.S. Department of State, through its Arts in Embassies Program, has selected a number of Kevin’s American landscapes to hang in embassies around the world. The U.S. Department of the Interior has twice commissioned collections of Kevin’s work: For the 75th Anniversary of the Grand Canyon National Park, Kevin created a series of paintings of the inner gorge of the canyon, and for the 85th Anniversary of Glacier National Park, he likewise produced a series of paintings of that park’s back country. Exhibitions of these series were held both at the parks and at the Department of the Interior Museum in Washington, D.C. For the 75th Anniversary of Shenandoah National Park in 2012, the Park Trust commissioned a limited edition giclée print of Kevin’s iconic “Old Rag and the Piedmont.” In addition, at the invitation of the Soviet government in 1989, Kevin accompanied a traveling solo exhibition of his work throughout the Soviet Union. Kevin grew up in Oxford, Maryland and studied painting at the American Institute in Southern France and the Minneapolis College of Art & Design. As an officer in the U.S. Marine Corps, he was recognized for his artistic ability and was awarded the title of Combat Artist. Kevin also has designed theatrical sets, including for the Washington National Opera. In addition to the Gay Street Gallery, Kevin is also represented by the Julie Heller Gallery in Provincetown, Massachusetts, and the Watergate Gallery in Washington, D.C. His work also is regularly displayed at The Inn at Little Washington.